It’s 100 years since British women got the vote, and all eyes are on the strides that women’s rights have made. 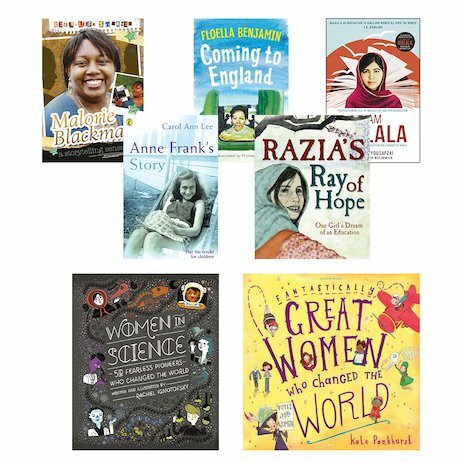 Now this uplifting pack lets you celebrate the incredible deeds of females from across the world. There are today’s high-fliers, such as author Malorie Blackman and young Nobel Peace Prize winner Malala Yousafzai. There’s iconic Anne Frank, tragically killed in the Holocaust, whose diary is one of the most famous historic documents of World War Two. There are books celebrating female scientists and pioneers, and the story of an Afghan girl’s fight to go to school. The perfect place to explore what women have achieved, and the tough odds they’ve often battled against.